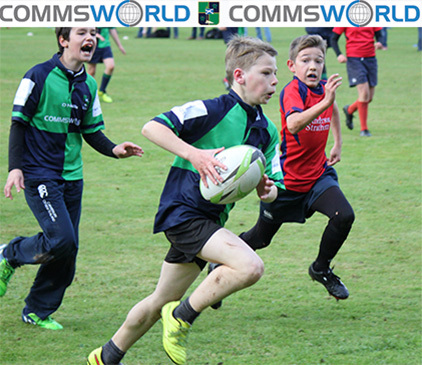 The P7s travelled to Gifford goblins this week for a friendly match with Gifford and Haddington. 'Muir had 15 players, a full squad for the match, which was exactly 12 more than Gifford appeared with. Fortunately Haddington had a full team and we agreed to play two match with them, fielding all the players and running some training activities within the matches. In the first match we sprinted to a 6 to 2 lead at half time, converting almost every time we have the ball and being more effective in the breakdown and stronger in the tackle than our opponents.We eventually ran out convincing 12 to 3 winners. Very pleasing was that tries were scored by almost every boy in a fantastic team performance. The second game was more of the same, where we again closed out with a comfortable win. Lots of good team performances, the coaches were delighted with the team organisation, teamwork and attitude. Well done all who travelled.